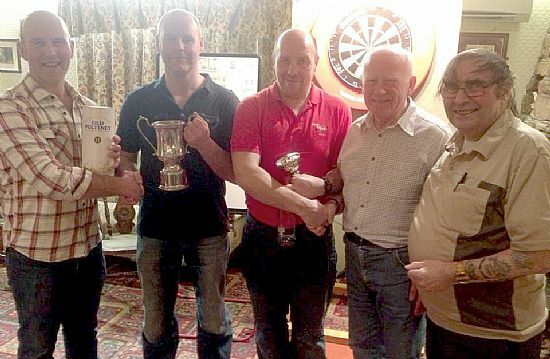 There was a terrific night of darts out at the Quoyburray, last Friday as 33 players turned up for the E. R. & T. Craigie Singles. As it was a ranking points event most of the top players were present and that included nine ‘B’ League players with two of them getting to the quarter-finals. Both of them put out a league player on the way. Making the semi-finals was Ian Linklater playing his brother Stevie and defending champion Ian Wilkie taking on Kevin Gray. After two very good games Stevie and Kevin advanced. Both Kevin and Ian had two 180s in the semi-finals — Kevin’s ones were back to back in a 13 dart leg.What a final the players were to serve up and what a finish from Kevin. The players swapped games to 3 all. Then the decider Stevie was down on 66 with Kevin well behind on 155 and then it happened — Kevin hit treble 20, treble 19 and double 19 for a 155 checkout — in one of the best finals seen in Orkney for some time. Kevin hit eight x 180s and four checkouts over a 100 during the competition. It’s all change at the top of the Williamsons ‘A’ League. The new leaders are the Golf Club, after whitewashing Sands ‘2’ 12 nil. Former leaders the Commodores lost their undefeated tag, crashing 10-2 to the Legion who are now only three points off the top. A big point for the Nomads, as they held Sanday to a 6 all draw that leaves Sanday 6 points off the Golf Club.There was also a narrow 7-5 win for Untouchables against Quoyburray, Quoyburray ‘B’ fared no better going down 8-4 to Untouchables ‘A’.Wanderers v RBLM was postponed. In the Williamsons ‘B’ League, St Ola remain the only team with full points after a 9-3 defeat of the Muppets, and staying in second spot are Legion Arrows after beating Tankerness 8-4. The only other game played saw Shore win 10-2 over Motorhoose. 180s: Ryan Tulloch, Ian Linklater, Alan Gray, Brett Dickinson, Raymie Rendall, Roy Griffith, Mark Shearer, David Kirkpatrick, Derek Firth, Wayne Monkman, Graham Firth, Neil Croy (2), Ian Wilkie (3), Stevie Linklater (4), Kevin Gray (10). High checkouts: Gordon Rendall (101), Bruce Moar (100) and (115), Ian Linklater (102), Raymie Rendall (103) and (120), Colin Barnett (104), Michael Muir Snr (106), Freddy Tait (110), Kevin Gray (110), (136), (145) and (155), Robbie Stanger (111), Stevie Linklater (114), Brett Dickinson (118), Jim Brown (119), Michael Moodie (125). It’s the younger boys’ chance this Saturday with the under 30s trophy in the Masonic at the new time of 3pm. It’s open to any player in Orkney aged 18 to 29. E. R. & T. Craigie Singles Final — Kevin Gray beat Stevie Linklater, 4-3. Williamsons ‘A’ League — OGC 12, Sands ‘2’ 0; Untouchables ‘A’ 8, Quoyburray ‘B’ 4; Wanderers P, RBLM P; Quoyburray 5, Untouchables 7; Sanday 6, Nomads 6; Legion 10, Commodores 2. Williamsons ‘B’ League — Motorhoose 2, Shore 10; Tankerness 4, Legion Arrows 8; Muppets 3, St Ola 9. Under 30s Singles (open) — Masonic — new time 3pm. ‘B’ League Singles — Masonic, 7.30pm. Williamsons ‘A’ League — OGC v RBLM; Sands ‘2’ v Nomads; Wanderers v Untouchables; Sanday v Quoyburray ‘B’; Quoyburray v Legion; Untouchables v Commodores. Williamsons ‘B’ League — Motorhoose v Legion Arrows; Shore v Masonic; Tankerness v St Ola; Shapinsay v Bilco Boys; Muppets v Murray Arms.